Students get up close and explore their studies. 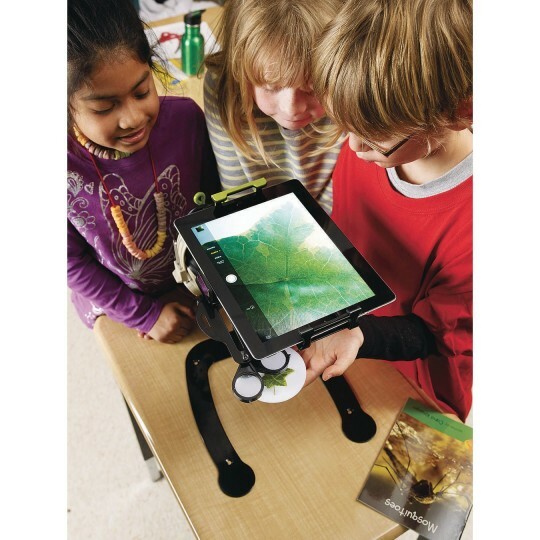 Turn your devices, including your smartphones and iPads®, into a document camera by utilizing the camera app. Now with the addition of a microscope, Dewey enables students to get up close and explore their studies. This high quality stand provides teachers and students with the opportunity to share work, ideas and anything else that inspires. Fits all versions of iPad® with a camera and various smartphones with or without cases. Microscope feature with 5x or 10x magnification and LED light. Improved height adjustment with a sturdier design, 90° rotating mount that swivels and tilts, keeping the device secure. Comes with headphone holder. Mounting holes on the base for securing Dewey to a surface.